Guest-starring Superman. In the wake of the Invasion! crossover, Josiah Power – a successful African-American attorney – finds himself gifted with super-powers, and his professional and personal life spiraling into ruin. But an encounter with Superman and the JLI (the Justice League of that era) will give him a chance to turn his life around, and set him on the road toward creating the Power Company. Josiah Power was a renowned lawyer and partner at a leading firm in metropolis. His life changed when the Thanagarians invaded earth. After they were defeated they unleashed a meta gene bomb which triggered his metahuman powers and left him in a hospital until an antidote was released. He returned to the life of a lawyer until his uncontrollable meta human powers triggered in a courtroom ending his career. Directionless he went to a meeting for new metahumans where both him and those were forcefully turned into a meta human supervillian army. Unable to trigger his transformation he was mostly a guinea pig for tests. The Justice League eventually arrived to save him and those captured but only after he consciously triggered his powers and took down the guards. Turning himself over to the authorities they released him after questioning him. Inspired by a talk with Superman he creates the “Power Company”. Cover– I like the design of this one. 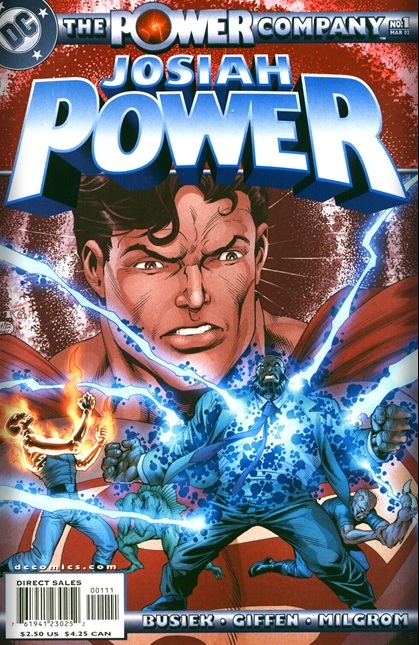 We have the 90’s DC Comics logo at the top with the Power Company banner running across the top, directly below is the Josiah Power logo larger than life in standout blue and white colors. Superman looms in the background while our titular star glows with energy the same color as his logo. Art-Keith Giffin and Al Milgrom come together and pull of work very reminiscent of classic Jack Kirby. It gives the book a very classic circa 1970’s feel that fits in despite the continuity context of the story. Black Hero- Meet Josiah Power a gay Lawyer with off the scale powers according to his captors but we don’t actually see his powers in any great scale this issue. We see hints of his transformation and his hand changes multiple times but the exact nature of his powers are a mystery this issue. Mystery– Great many superhero fans would have liked to know and see the use of the heroes’ powers in his debut as opposed to all this mystery. ← Amazing Spider-man 2's Sequels Could Introduce Miles Morales! I liked all the characters and the way the the were depicted . I found them to be be very realistic and “human” in their thoughts and actions . I really liked the Sky Rocket character. I liked her motivation and commitment ( she left her carrier in the militarily and took up a job in fast food management so she could keep on being a super hero . ) I did enjoy the part of her story in which she is surprised and pleased that the Power Company tech support is able to improve her technology( quietly making the point that it is some times it is better and more advantageous to belong to group ). I do wish that this series had lasted and that the current comics were more like it .